This blog contains perspectives, insights and reviews of books on or related to Corporate Social Responsibility or Sustainability that I have read. Personally. NOTE: The URL of this blog is now www.thecsrbooksblog.com. Please make sure your RSS feeds / bookmarks are up-to-date! By 2050, the world's population is estimated to grow to 10 billion. To feed everyone, we will have to double our food production, to produce more food in the next 40 years than in the whole of the last 6,000. Changing the Food Game shows how our unsustainable food production system cannot support this growth. In this prescient book, Lucas Simons argues that the biggest challenge for our generation can only be solved by effective market transformation to achieve sustainable agriculture and food production. Lucas Simons explains clearly how we have created a production and trading system that is inherently unsustainable. But he also demonstrates that we have reason to be hopeful from a sustainability race in the cocoa industry to examples of market transformation taking place in palm oil, timber, and sugarcane production. He also poses the question: where next? Provocative and eye-opening, Changing the Food Game uncovers the real story of how our food makes it on to our plates and presents a game-changing solution to revolutionize the industry. Lucas Simons says: "The way we produce and trade our food has become a classic example of failing systems on a massive scale, with unprecedented implications for hundreds of millions (in reality more than a billion) of people, for many economies, and for our planet as a whole. Fixing agriculture is probably the challenge of our generation and we will not get a second chance to get it right." His story starts at El Volcán, a mid-sized coffee farm in the Guatemalan Highlands, during the time that Lucas was the manager of a foundation with an ambition to make the global coffee sector more sustainable, creating a new sustainability standard for coffee in the region for use by global brands. This was supported by Ahold Coffee Company in the Netherlands. Lucas's first hand view of the transformation that a responsible and sustainable approach to agriculture can make on people's lives was a defining experience for him. The book is in two parts. Part One describes the global challenge and shows the importance of our global food producing systems and the enormous impact it has on our economies, ecologies, and societies. It also explains what goes wrong in the system that drives this negative impact. Part Two introduces an approach to initiate and accelerate systemic change and uses real-life examples of agricultural commodity markets that have gone through, or are currently going through systemic change. The scale of the food industry is all-embracing with more than one billion people who work in agriculture and more than 500 million farmers, of whom the vast majority are smallholders. Another 500 million people work in marine agriculture. Simons tells us that agriculture affects everything, from the way people make a living to the way land is used and transformed to provide food, taking up close to 40% of the world's land surface. This is endangered through desertification and soil degradation which are rapidly eroding fertile land available for agriculture. Increasing global water withdrawal, biodiversity loss, disappearance of natural habitats, chemical pollution, eutrophication are all terms that most of us have heard in connection with sustainability challenges. And let's not forget that agriculture is the third largest emitter (14%) of total global greenhouse gas emissions, while forestry, deforestation, land clearing for agricultural purposes, and fires or decay of peat soils account for another 17%. All of these issues are taking their toll on current and future food availability and the quality of life for generations to come. On the social side, "child labor, slavery, hunger and poverty are, in many cases, directly related to agricultural production." Problems of labor exploitation, unsafe working conditions and lack of nutrition characterize many of the conditions in the agriculture sector. All of this, together with the rising demand for food as the world's population grows, astounding levels of food waste and biofuel demands competing for a share of cornfield output, forms the basis of a compelling case that Lucas Simons lucidly presents for radically changing the food system. Lucas Simons takes us through systems change theory, keeping it simple and describing the concepts in sstraightforward terms with supporting illustrations. Bottom line, the current system reinforces unsustainability. Artificial pricing based on government subsidies in Western economies and no subsidies in emerging economies, massaging of supply and demand with little correlation to actual need, externalization of costs, dumping of surpluses etc... all this contributes to an unequal system which perpetuates benefits to rich industries and governments and exacerbates deficiencies and challenges for poor farmers and communities. A system which is designed by those in charge for those in charge keeps us from breaking out of negative loops and creating reinforcing positive cycles that could actually transform global food availability and security for the benefit of all. From coffee trading to the hidden uses of sugar and from destruction of tropical forests to human trafficking, the agriculture sector has not yet seen its best day. "How do you change systems that are caught in negative spirals?" asks Lucas Simons. Lucas then goes on to answer this question by defining four phases of change, underpinned by connectivity, transparency and collaboration between all players. The awareness and project phase, which raises general awareness in the sector about the problems and elicits an initial response. The first mover and competition phase, which mainly addresses the market failure by creating incentives for the market to compete on doing the right thing. The level playing field phase, which addresses the institutionalization and legalization of the new normal and new norms. What's important here is that, invariably, change starts through the catalyzing effect of a crisis. For example, the palm oil fires in Indonesia in 1997 were a wake-up call about the devastation caused by deforestation, with the fires destroying an area the size of Switzerland with regional economic costs estimated at $9 billion and dangerous air pollution effects felt throughout southeast Asia. Ultimately this led to the foundation, with the leadership of Unilever of the RSPO—the Roundtable on Sustainable Palm Oil - which drives a sustainable approach for companies buying palm oil. Simons also provides examples from the coffee sector, the cocoa (chocolate) sector and others, demonstrating the degree to which crisis has to be present in order to galvanize entire markets into action. Inevitably, thereafter, there is one major player, often a corporation or an NGO or a government, or a collaboration of two or three players, that makes a disruptive move towards change. Examples from the soy, tea, cut flowers, livestock, sugarcane, tropical timber sectors and more show how, once the horse has bolted, the race for more sustainable standards is on, sector by sector. This eases into the third phase, that of establishing critical mass. A leading example here is the cocoa industry, where sector wide collaboration has created a new platform, CocoaAction, "that brings the world’s leading cocoa and chocolate companies together to sustain the cocoa industry and improve the livelihoods of cocoa farmers through meaningful partnerships between governments, cocoa farmers, and the cocoa industry to boost productivity and strengthen community development in Côte d’Ivoire and Ghana – the largest cocoa producing countries in the world." (quoted from the CocoaAction website). Lucas Simons maintains that, although progress has been made, none of the sectors he has showcased in the previous phases of change have so far been able to achieve a leveling of the playing field by "institutionalizing and codifying the new norms". However, egg production, electronic waste and light-bulbs are sectors where new ways of working prescribed by law or prohibition of products or processes backed by law are now in place. As Lucas Simons says: "Sustainability will become a mainstream qualifier." Sooner or later, this will have to work in agriculture too. The final part of this book is all about adding perspective through 12 questions (and answers) that people frequently ask about making transformation in markets and behaviors become a reality, and ten examples of "inspirational change-makers" who, in their own way, are creating transformation in different fields. These include a drive to change the way soy farmers use herbicides and pesticides (to prevent people getting sick), creating a new way of handling waste in Indonesia, a movement to halt soil erosion in Turkey and a campaign to stop drunk driving. All are fascinating and inspirational examples. Changing the Food Game way surpassed my expectations. It is immensely readable, in a style that flows easily and is not overburdened with technobabble. It is thoroughly informative, appearing to be well-researched and supported with facts, figures and numerous case studies. While the title focuses on food, the book is really about market transformation and how this happens in a range of sectors, not just in agriculture. I found this book to be an extremely worthwhile read and it taught me much. Overfished Ocean Strategy offers five essential principles for innovating in this new reality. Zhexembayeva shows how businesses can find new opportunities in what were once considered useless by-products, discover resource-conserving efficiencies up and down their value chain, transfer their expertise from physical products to services, and develop ways to rapidly try out and refine these new business models. She fills the book with examples of companies that are already successfully navigating the overfished ocean, from established corporations such as BMW, Microsoft, and Puma to newcomers such as Lush, FLOOW2, and Sourcemap. The linear, throwaway economy of today—in which we extract resources at one end, create products, and throw them away at the other—is rapidly coming to an end. In every industry, creative minds are learning how to make money by taking this line and turning it into a circle. Nadya Zhexembayeva shows how you can join them and avoid being left high and dry. 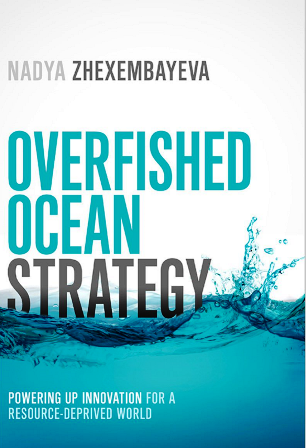 I have had the privilege to hear Dr. Nadya Zhexembayeva deliver keynote addresses twice in the past couple of years, and both times, I have listened to her articulation of the headlines of the Overfished Ocean Strategy with absolute focus, totally absorbed in the message and in the delivery. Now, Overfished Ocean Strategy has hit the shelves and I find drawn to its simply stated narrative and coherent arguments. Don't let that simplicity deceive you. The book is the result of deep-dive research and a good deal of leadership thought and intelligent analysis. By the end of the book, you not only know what the Overfished Ocean Strategy is all about, you know how to get there. You also want to. And, you want others to, as well. The book starts with an overview of our new competitive reality. One in which we are trashing more than we have places to put the trash we generate. The linear economy has outlived its usefulness and is now hurling us along the path to oblivion. Declining resource reserves, the volatility of fossil fuel prices, water scarcity, climate change and weather extremes, with high insurance premiums hot on their heels, and overconsumption of stuff that becomes obsolete all too quickly are the defining warning signs of a crisis in the making. It's a throwaway economy. But all is not lost. Yet. The wealth of ideas, some already successfully implemented, on how to create bottom up sustainable design is what will save us. It's not only about "disruptive innovation for a resource-deprived economy". It's about a new economy, designed from the ground up to recreate the way we innovate and generate value. Instead of rewarding those that handle trash, we should target to eliminate trash at source. This means rethinking our world and stopping overfishing the oceans. There are five central ideas that take us through the journey to an appropriately fished ocean. First: From line to circle: a circular economy in which the waste of one process becomes the raw material for another. Michael Braungart and Bill McDonough's Cradle to Cradle took this concept to scale, and although it makes perfect sense, it's still not even approaching common practice by a big margin. Second: From vertical to horizontal: expanding horizons and approaching business strategies by engaging with the entire supply network at all levels, not just upstream and downstream to suppliers and customers. Through fundamentally remapping supply chain relationships and engaging in partnership spirit with key players, the top-down bottom-up approach to doing business becomes as obsolete as the items in the linear economy that we dispose of so rapidly. And with a direct link to what we might otherwise know as sustainable business practice, Nadya recommends stakeholder mapping as an essential tool in the Overfished Ocean Strategy toolkit: "It is surprising how few managers I meet that are able to think in terms of stakeholder needs and risks - even within their organization, let along outside of it." Third: Growth to Growth: When we think growth, we think more money, more production, more output, more sales. Theoretically, all this should lead to more profit. But in a linear economy, it also leads to more of the stuff we have to find places to trash. Overfished Ocean Strategy tells us we should be looking for a new kind of growth, one that is based on the value we generate not the items we manufacture. By shifting the paradigm of what constitutes value - services rather than physical products, meaning rather than mass production - companies can reframe their offering and meet society's needs in a different way. "Building relevance into everything a company makes is not an easy task" writes Nadya. "What matters is meaning. The good news is that meaning comes in different forms, and in unlimited supply". Fourth: From Plan to Model: "Planning is overrated" (I am glad to hear this! I can't remember anything good ever coming from a business plan... :)) This fourth principle of the Overfished Ocean Strategy urges us to constantly adapt to the new reality. By the time we finish our plans, reality has changed. It's better to work on the basis of a constantly evolving model rather than a rigid prescriptive plan. Such a shift might, for example, urge you to get out there in the market with a less than complete product (according to plan) and take the plunge with something that can evolve as the market evaluates how to use and benefit from it. Don't plan. Plan to model. Fifth: Department to Mind-Set: Here we go on a journey back to the ancient Sumerian civilization that developed the concept of division of labor in the roles citizens played in Sumerian cities. Current corporate life is pretty much the same. But, according to Nadya, "resource intelligence is not an easy-to-follow principle. Line-to-circle thinking cannot depend on narrow functional brilliance.The Overfished Ocean Strategy does not fit into a small box or department". And then she adds: "The majority of companies I met got it wrong." Even "the sustainability department" gets knocked on the head here. (I agree with this to a point, thought I personally believe that there is and always should be a place for a sustainability specialist in every company, that acts and an integrator, an overseer of sustainable principles and practices, and a coordinator of sustainability communications, without replacing the individual accountability that all leaders, managers and employees must integrate these into their daily roles). Overfished Ocean Strategy follows a simple consistent message that most of us won't be challenged to understand and even agree with. Each chapter is peppered with examples of practice from large corporations and small companies we've never heard of, and supplemented with guidance for how to make the shift. Relevant and sometimes humorous quotes from a range of thought-leaders add interest. The toolkit section at the end of each chapter provides valuable suggestions about where to look for additional help or inspiration. The book does not propose a quick fix. But it does provide several diverse examples of the Overfished Ocean Strategy being played out today in companies across the world. We can learn from all of them. Nadya's earlier book, Embedded Sustainability, co-written with Chris Laszlo, was spectacular, and well worth the investment of time to read. This one is easier on the brain, faster and more entertaining, and plays to both our intellect and to our emotions. It's a book with charm that totally packs a punch. In both cases, it's a perfect reflection of Nadya Zhexembayeva. You have my strongest recommendation to read it and absorb its message. It won't take you too long, but it will leave a lasting change in your thinking. 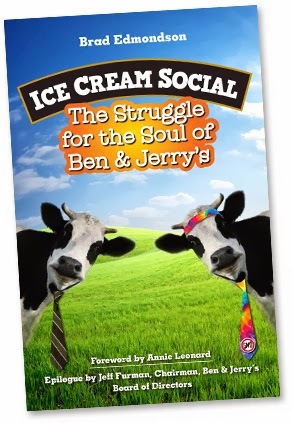 The Struggle for the Soul of Ben & Jerry’s is the first book to tell the complete story of a beloved company’s inspiring rise, tragic mistakes, devastating fall, determined recovery, and ongoing renewal. For over three decades, Ben & Jerry’s has tried to achieve “linked prosperity,” or the idea that the owners of the company should share their success with all of their stakeholders — employees, suppliers, distributors, customers, cows, everybody. Living up to this ideal is fun when you’re doing it right, and it creates amazingly loyal customers, but it isn't easy. As a self-confessed ice-cream addict, it was more than obvious that I would want to read and review this book. Also, as a former Unilever employee, I have an additional connection to the Ben & Jerry's story. Add that to the CSR and social business theme, and you couldn't find a book that I could connect with on any more levels. More than this, the book reads like a who's who of the history of the CSR movement in the U.S. with all the big names – Paul Hawken, Anita Roddick, Simon Zadek and more – who played a role in the rise, struggles, challenges, development of, and survival of, the legendary Ben & Jerry's ice cream business. The story of Ben & Jerry's is recounted by journalist Brad Edmondson, whose many hours researching and interviewing past and present Ben & Jerry's protagonists is evident in the depth of the narrative. Actually, this book provides a background that I suspect many don't know, and insights which put a new perspective on the amazing journey to a leading ice cream brand and the concept of linked prosperity. I hadn’t come across this term before, although it resonates which my impression of how the Ben & Jerry's operation was run. Linked prosperity is the "simple but radical idea that when the company benefits, everything it touches should also benefit, including employees, suppliers, customers communities and the environment." Today, that concept is well-known, but back in the 80s, it was far less common. A couple of the first expressions of linked prosperity that many perhaps do not know include the creation of the Ben & Jerry's Foundation as a way of channelling 7.5% of pretax profits (nearly four times the national average) to social causes and the introduction of a salary ratio of five to one between the highest and the lowest salaries. The prosperity of Ben and Jerry's was also directly linked to its local community through a share offering restricted only to Vermont residents, so that in 1984, after the first offering, "nearly 1% of the households in the state owned shares of Ben & Jerry's". One of the first cause marketing campaigns undertaken by Ben & Jerry's was the sale of Peace Pops, under the One Percent for Peace banner, a new organization supported by Paul Hawken and other visionaries to rechannel 1% of the U.S. defense budget to cultural and economic exchanges between the U.S. and the Soviet Union. In 1988, Ben & Jerry's unveiled its social, economic and product centric three-part mission, a precursor to the triple bottom line we all are familiar with today. Later, the company started to include non-financial disclosures in annual reports and gradually progressed to fully audited social accounts. In the book, Brad Edmondson describes the risks that this pioneering approach brought for Ben & Jerry's, alongside the detail of the challenges of performing full social audits and paving the way, by establishing new methodologies, so that larger companies such as Disney and Nike could move into this space as well. This significant role that Ben & Jerry's played in moving CSR forward is probably not widely known and it makes for absolutely fascinating reading. The path to sustainable sourcing was also not as smooth as the new range of sorbets that Ben & Jerry's brought out to compete with Hagen Dasz in 1996. Fair trade vanilla farmers in Costa Rica became a less reliable source and alternatives had to be found. The apple-pie social enterprise source La Soul sued Ben & Jerry's when apple-pie flavored frozen yogurt didn't sell. Other challenges that plagued Ben & Jerry's included finding the right leadership, especially when the company was under financial pressure in the 90s, and this was so much harder given the founders' determination to give equal weighting to each part of the Ben & Jerry's three-part mission. Ironically, Perry Odak, the externally-hired CEO in the late 1990s, whose belief was "let's make the economics work first" and who started to try to quantify the incremental costs of the social mission for the first time, was the one who managed to save the Ben & Jerry's balance sheet. But he was also the one who is attributed with moving the company towards its historic sale to Unilever. And this is probably the part of the book that almost every wants to read first (though it's much better if you take in the first eight chapters before you do). What really went on behind the scenes that led to the iconic socially-led progressive premium ice cream small-guy Ben &Jerry's to be gobbled up by the global powerhouse Unilever is the big attraction of this book. We all recognize that today, Ben & Jerry's largely survived the Unilever gobble-up, and emerged with its values, creativity, social identity, great flavors and even a little of its irreverence as a brand intact. How Ben & Jerry's managed to do this in the face of Big Business is the most compelling part of this book, even before you read it. Chapter Nine is where the stakes are upped. The account doesn't disappoint. Albeit containing less drama, door-slamming and storming-out of meetings than we might have anticipated, the sale negotiation process was not without its ups and downs and the roles of the different characters involved on both sides is illuminating, and shows, ultimately, they even Big Business is about people with values and their determination to make things happen. Ben & Jerry's secured terms for this acquisition deal which helped preserve much of its character and a good degree of its independence, even though, down the road, the company would have to take Unilever to hand for breaching the agreed provisions. Eventually, after Paul Polman took the helm at Unilever, and brought with him a great focus on strategic CSR and a new openness, the path to a cautious rebalancing of the three-part mission became navigable. In urging Unilever to take on greater sustainability goals, Polman cited Ben & Jerry's as one of the model companies in the Unilever family in terms of championing social environmental causes and others confirmed they sought to learn from Ben & Jerry's in areas of sustainable sourcing and fair trade. Ben & Jerry's had come full circle, and the founding partners could continue to feel proud of the institution they had developed, despite the devastating feeling of having sold their company. There is much more to this book than I expected, and if anything, one of the greatest insights is that it is really no picnic trying to be a socially responsible company and thrive. The five to one salary ratio disappeared when it became untenable, the costs of sustainable sourcing almost bankrupted the business, and the relationships between board and management became strained beyond measure. The ability of Ben & Jerry's to survive and grow through all of this is as much due to the perseverance of principle in general, allowing some flexibility of principles in practice, as it is to a smart group of people who appeared in the right place at the right time to make the right decisions, powered by a vision of linked prosperity, the spirit to see it through and a shared sense of the inevitability great-tasting ice cream with a backbone. There's only one secret that Brad Edmondson didn't reveal about Ben & Jerry's – and that's how to get membership of the Free Ice Cream for Life Club. Now THAT's something I'd like to know. Employees are central to creating sustainable organizations, yet they are left on the sidelines in most sustainability initiatives along with the HR professionals who should be helping to engage and energize them. This book shows business leaders and HR professionals how to: motivate employees to create economic, environmental and social value; facilitate necessary culture, strategic and organizational change; embed sustainability into the employee lifecycle; and strengthen existing capabilities and develop new ones necessary to support the transformation to sustainability. Talent, Transformation, and the Triple Bottom Line also demonstrates how leading companies are using sustainability to strengthen core HR functions: to win the war for talent, to motivate and empower employees, to increase productivity, and to enliven traditional HR-related efforts such as diversity, health and wellness, community involvement and volunteerism. In combination, these powerful benefits can help drive business growth, performance, and results. Since the publication of my book, CSR for HR: A necessary partnership for advancing responsible business practices (Greenleaf, 2010) and even for some time before that, my mantra has been "It is time for HR to wake up to CSR!" The opposite is also true, and business-led CSR also needs to wake up to the potentially massive contribution that the HR function can make in advancing sustainability efforts. This is why the CSR-HR partnership is so necessary. My book was hailed as the first on the market which covered this aspect of embedding CSR in corporations. Too often, we hear about employees being critical to sustainable success, being the heart of the business and a key actor in sustainability efforts, but all too frequently, the role of HR in galvanizing, catalyzing and activating employees in support of an aligned organizational sustainability-enabled culture, is overlooked. My book was an attempt to bridge that gap, showing how HR can and should get on the playing field and attempting to provide a highly practical approach to doing so. Since 2010, I have been engaged in many conversations around this topic: I have chaired a conference on CSR for HR, presented to groups of sustainability professionals in companies, and at local CSR events in several countries (see www.csrforhr.com), written in several publications, run a training webinar series and also, a 12 hour online course for Masters students at Steinbeis University for the past three years. I was also delighted when HR-profession-thought-leaders at the SHRM Foundation commissioned an Effective Practice Guideline on HRM's role in Corporate Responsibility and Sustainability, which I co-wrote with distinguished professors, Sully Taylor and Michael Muller Camen, and which is now freely downloadable, showing that the profession is starting to sit up and take note. And now, I couldn't be happier to note that a second book has been published, adding important context and background to the role of HR in organizations and the role of business leaders in understanding the HR contribution. 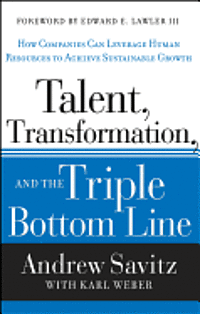 The book is Talent, Transformation and the Triple Bottom Line, by Andrew Savitz and Karl Weber. Andrew Savitz is a well-known player in sustainability fields and many will know his excellent earlier book, The Triple Bottom Line, published in 2006, also with Karl Weber as co-writer. Part Four examines employee engagement and its role, and that of HR, in advancing sustainable business. The book offers examples of thinking from several large companies such as GE, Campbell's Soup, PepsiCo, Nike, AEP, J&J, BT, as well as some case studies from smaller companies. Each chapter concludes with questions that business leaders could ask themselves to help them identify the state of Sustainable Leadership and Sustainable HR practices in their own organization. The first part of the book, an in-depth study of the way GE has transformed itself into a company focuses on sustainability practices and the opportunities provided by ecomagination and healthymagination. These initiatives now only hit the "sweet spot" of sustainability (using the term coined by the Savitz -Weber partnership in their earlier book) but also have become attractors of talent. 75% of students want to work in ecomagination, says Beth Comstock, GE's SVP and CMO, quoted in the book. The rest of the book takes us on a journey through all traditional and new HR processes, products and activities, providing important context and persuasive arguments that support HR becoming a full partner in sustainable business, and also, the opposite...that business is not optimally sustainable without this contribution. Take the example of J&J, whose performance in product quality and product recalls in recent years has deteriorated, despite the Tylenol affair of the 1980s which gave J&J significant credibility as a responsibly-led business. Savitz writes: "In the case of J&J, we believe that at least on significant cause of the failure involved flawed personnel practices, especially related to the hiring and firing of employees". Recruitment and "winning the war for talent" is a key theme of Sustainable HRM and PepsiCo is featured, showing how "Performance with Purpose" has become a "powerful recruiting tool". Onboarding for sustainability, career development, leadership programs and compensation for sustainability are discussed, making the CSR-HR link clear. Andrew Savitz says: "Many of HR's traditional corporate roles - whether linked to employment processes managed by HR or to specific products or deliverables that HR is expected to create for the organization - are being transformed by the advent of sustainability. But the age of sustainability is also creating enormous opportunities for HR professionals to accomplish many traditional objectives and guide the companies they work for in even more innovative ways". In Part Three, the focus is on organizational capability, and Savitz talks about seven "of the most crucial capabilities that organizations need in order to become more sustainable". These are: Innovation, Collaboration, Long-term Orientation, Outward Focus, Interdependent Thinking; Learning and Adaptability. Savitz maintains that "HR is uniquely positioned to ensure that these and other essential capabilities are nurtured across departmental and divisional boundaries". In the book, examples are provided of how the HR function can support the development of these capabilities. In a chapter entitled "The Link between Sustainability, Engagement and Profit", the book refers to the movement toward sustainability which may strengthen the loyalty, motivation and commitment of workers but cites lack of awareness as blocking the realization of these benefits. "The failure to connect these dots may be a huge missed opportunity for sustainability leaders, HR professionals, CEOs and the organizations they serve". Savitz's "Golden Triangle" of Sustainability - Business Results - Employee Engagement demonstrates that "as employee engagement increases, the company may enjoy related business benefits such as higher productivity, reduced turnover and absenteeism, and lower costs of employment..." The case of Marks and Spencer is offered as an example of turning "bystander employees" into participants in the company's sustainability efforts under the umbrella of Plan A, "which was deliberately designed to involve rank-and-file employees throughout the organization". Plan A, as most of us probably know, has yielded impressive results since it was launched in 2007. Employee engagement is noted in Talent, Transformation and the Triple Bottom Line as "perhaps the most critical component of the .. transformation process". This book reinforces the message that HR leadership is necessary for sustainability, and sustainability is necessary for HR leadership. For those business and sustainability professionals who are not yet convinced, or who do not understand the multiple linkages or even the potential power of the HR contribution, Talent, Transformation and the Triple Bottom Line will help you get things in perspective. While this blog was intended as a place where I could review books that other people have written (and I apologize for a long silence, as I have not managed to make the time both to read AND review some great books in recent months), I will break the mould by making a temporary role-switch. This time, instead of a review written by me of a book by somebody else, it's the other way around. Please find below a great review written by Debbie Griffiths of Ideal Word Ltd, a CSR and Sustainability communications and consulting firm, based in the UK. Ideal Word practise what they preach as an SME and have published six fabulous own CSR reviews for their own company - the latest one being their 2012 CSR Review . Here is Debbie's review, first published on her blog, Ideally Speaking, on 11 February 2013. Sustainability Reporting for SMEs by Elaine Cohen was sizzlingly hot off the press when I bought a limited-edition hard copy at the Smarter Sustainability Reporting conference last week. Published by DōSustainability, the book is intended to be downloaded as a DōShorts 90-minute e-book for your commute. As one half of an ethical micro-enterprise that has been publishing CSR reviews for the past six years, I was instantly attracted to the title. At last, a respected name in the industry was providing advice for people in my position. Also, Elaine Cohen runs her own SME, so she knows exactly what she’s talking about. That said, I agree with her assertion that the book would be equally valuable for sustainability managers in larger companies whose success depends on the transparency and accountability of their supply chain – a very hot potato in the UK food chain right now! Anyone wanting to encourage their SME suppliers to report on sustainability issues would do well to start them off with this book. Elaine gives clear descriptions and definitions that would be helpful to SMEs doing this for the first time, along with real-life case studies and practical how-to guidance. One of the things I found most illuminating was the fact that the Global Reporting Initiative (GRI) framework and the UN Global Compact Communication of Progress were tools that could easily and usefully be used by SMEs. I’d always thought they were for large companies, not one of my size. The ‘Roadmap to Transparency’ chapter is my favourite and I’ve gleaned many ideas that I want to put into practice to take our sustainability reporting onto a higher level. I also got a lot out of the ‘Guidance for Developing a Sustainability Report’ chapter. My only concern is whether the book’s title is appealing enough for a more mainstream SME audience? Elaine talks about the importance of giving sustainability reports an eye-catching title and says she wanted to call this book: ‘Make More Money: Sustainability Reporting for SMEs’. I think she should have gone with that if she wanted to reach a wider variety of SMEs, way beyond those of us who are already converted to the cause. Debbie Griffiths is a sustainability consultant, copywriter and co-founder of Ideal (www.idealconsulting.co.uk ), a values-led business specialising in wordsmithing, branding and CSR. Many thanks, Debbie for this great review! 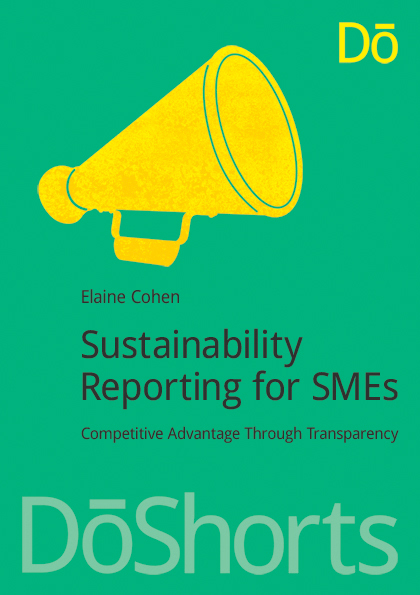 I hope this short book will also be useful to the many many SMEs out there who would benefit from Sustainability Reporting (and make more money) but don't quite know where to start. Elaine Cohen, CSR Consultant, Sustainabilty Reporter, HR Professional, Ice Cream Addict. In 2008, Howard Schultz, the president and chairman of Starbucks, made the unprecedented decision to return as the CEO eight years after he stepped down from daily oversight of the company and became chairman. Concerned that Starbucks had lost its way, Schultz was determined to help it return to its core values and restore not only its financial health, but also its soul. 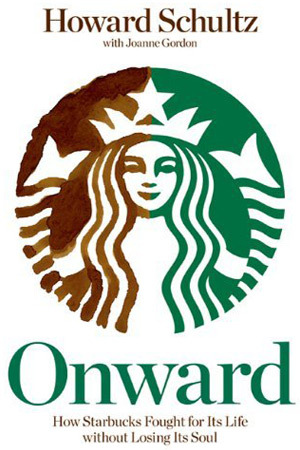 In Onward, he shares the remarkable story of his return and the company's ongoing transformation under his leadership, revealing how, during one of the most tumultuous economic times in history, Starbucks again achieved profitability and sustainability without sacrificing humanity. Offering readers a snapshot of a moment in history that left no company unscathed, the book zooms in to show, in riveting detail, how one company struggled and recreated itself in the midst of it all. Onward is a compelling, candid narrative documenting the maturing of a brand as well as a businessman. I have never actually tasted a Frappuccino, but, after reading Onward, by Howard Schultz, I am tempted to try it out the next time I am in the vicinity of a Starbucks. Onward is the story of how Howard Schultz came back to turn Starbucks around after its plummeting performance in 2007, the year in which the company's stock dropped 42 percent. A deeply personal account of the day-by-day deliberations, decisions and consultations that led up to Schultz's decision to remove the then CEO, Jim Donald, and reposition himself in the driving seat, and everything that followed up until late 2010, when Starbuck's was enjoying its "best financial performance in its almost 40 years history" with stock prices up 400% in two years, is compelling reading. Written in an easy narrative, sharing dilemmas, challenges and aspirations, this is Schultz's second book and continues the story of both Starbucks the company and Starbucks the man through all their different facets. Schultz created the Starbucks of today when, in 1987, at the age of 34, he bought the Seattle-based Starbucks Coffee Company for $3.8 million, "determined to create a different kind of company… which would act through a lens of social consciousness". The original Starbucks sold coffee beans and ground coffee. Schultz had created a small chain of coffee bars modeled on the Italian coffee shop tradition. The new Starbucks was a blend of both. Ultimately, for Schultz, coffee is a way of bringing people together. Starbucks' stores are a place for people to connect. The "Starbucks Experience" creates personal connections. "We are all hungry for community", writes Schultz. When, in 2007, seven years after Schultz had stepped down from the role of CEO to become Chairman, with a mandate to guide Starbucks' international expansion strategy, Schultz began to perceive that profit considerations and non-core opportunities to sell music, food, books, movies and more, were weakening the positioning of Starbucks in the U.S. market, moving the Company away from the true coffee-flavored soul of the business. Schultz wrote a memo, sharing his concerns at this mission drift. The memo, which was to become known as the "Commoditization of the Starbucks Experience", was designed for internal distribution but, when leaked to the press, it created a public debate about the essence of Starbucks and its strength as a business and role in society. In many ways, this was a catalyst for new insight about the relevance of Starbucks and its future path. 1. Become the undisputed coffee authority: After the ultimate insult, when a Consumer Report taste test rated Starbucks' coffee behind McDonald's, leaving Schultz "stunned", Starbucks had to regain the upper hand in becoming known as the best coffee sourcer, roaster and brewer. This aspiration led to the decision to shut down Starbucks all over the U.S. for an afternoon in 2008, to spend time retraining 135,000 baristas on how to make great coffee. Apparently it's not as easy as it looks and closing stores to deliver synchronized training of every single employee, was quite an unprecedented and bold act. 2. Engage and inspire our partners: Partners, in Starbucks-speak, are employees. Schultz tells how employees were always given a decent deal at Starbucks, including full health insurance benefits, in a business context in which this was a long way from being the norm. Engaging employees in community service has also been a strong factor in the Starbucks culture. 3. Ignite the emotional attachment with customers: Improve customer service, making it ever more personal. The Starbucks Loyalty Program was to become a big winner. Free wifi also helped. Starbucks' regulars are treated to personal notes from baristas on their coffee cups. MyStarbucksIdea.com invited customers to help make Starbucks better, while social media was jacked up to best-in-class levels, supported by a corporate website that receives 12 million visitors each month. Improved store décor and more added to Starbucks new blend of customer-first thinking. A change in advertising strategy got the message out with greater clarity. 4. Expand global presence: With less than 1 percent of the global coffee market, Starbucks had to make itself relevant in other countries and exploit great growth opportunities. China became a target market and localized innovation even included specialties such as Black Sesame Green Tea Frappuccino. 5. Be a leader in ethical sourcing and environmental impact: Working with Fairtrade and Conservation International, Starbucks needed to strengthen these partnerships in order to gain true value for the company. By 2009, Starbucks was the largest purchaser of Fairtrade coffee in the world. LEED-ification of stores reduced energy and water consumption significantly. Hooking up with Product RED gave Starbucks an additional social benefit by contributing to AIDS HIV relief in Africa. 6. Create innovative growth platforms: Everything from the design of new espresso machines, the development of a new Pike Place Roast coffee flavor, Starbucks instant coffee, and new food offerings were rolled out at a pace. 7. Deliver a sustainable economic model: Returning to pre-crisis profitability, including closure of hundreds of stores, employee layoffs, revamping the entire supply chain and introducing new technologies for store management and communications, plus aggressive cost-cutting in many and varied ways, contributed to Starbucks' increase in operating margins. By far, the greatest appeal of this book is the way the narrative is driven by Howard Schultz's personal account of all the dilemmas he faced, combined with insights from Starbucks' employees in letters they sent to Schultz. As CEO, Schultz instituted an "open inbox' policy, whereby employees can write to him and get a response, time permitting. A regional director of operations wrote: "I can't begin to tell you how proud I am to be a partner". A district manager in Canada wrote: "I have absolute faith that fantastic things are ahead." A district manager in California wrote: "You can be sure that the Spirit of Starbucks is alive and well in San Diego!" The ability of Schultz to inspire with a vision of creating emotional connection through the Starbucks brand appears to have worked internally as well as externally. In addition to sharing insights from employees, Schultz describes in detail the relationships he struck up with mentors, which included Michael Dell of Dell Corporation, and communications agencies, organizational specialists and more. Schultz's knack for hand-picking his own leadership team as well as engaging external specialists appears to have been pivotal in executing the Starbucks' transformation. The blow-by-blow account of the way Schultz put in place the right people to deliver his renewed vision is well worth reading. At all times, Howard Schultz takes pains to reiterate the importance of values and the way conflicts were resolved in the organization from a values-based standpoint under his leadership. While this book is clearly written from the Schultz autobiographical perspective, which at times is rather rosy, it is an engaging account of turning around a global business with a sustainability focus. Schultz is not usually the first name that springs to mind when people talk about sustainability visionaries of stature from the business sector – Anita Roddick, Yves Chouinard, Ray Anderson, and Ben and Jerry, and a few others, generally make the list. Schultz doesn't usually figure. However, in Onward, Schultz stands out as a visionary and a person of principle, striving to make his business as relevant and valuable to society and environmentally sustainable as have any of the other business sustainability celebs. Another demonstration of this is the way Starbucks confirms its impacts on society and accepts accountability through the transparent reporting practices of the Company. There are lessons for CEO's and many others in Onward. It is certainly a gripping, entertaining and worthwhile read. Uncover destructive thought patterns with yourself and others. Diffuse drama and lead the person in front of you. Stop managing and start leading, empowering others to focus on facts and think for themselves. Leadership accountability is one of the most underplayed themes in sustainability today. This shows up when heads of companies receive massive bonuses that are not directly tied to corporate performance. It shows up in the way employee performance is evaluated – using inputs (what people do) rather than outcomes (what results they deliver). It shows up in the fact that 31 percent of employees are actively engaged in their jobs (and 17 percent are actively disengaged). It shows up in the fact that "71 percent of workers think about quitting their jobs every day." It shows up in the fact that far too many underperforming people remain far too long in organizations in which they are not positively contributing (and in some cases, they are actually causing damage). Tenured employees whose skills are not current – leaders must raise the bar for performance and decide who makes the grade and who doesn’t. Employees at the top of their pay scale who no longer deliver top value – this happens when "leaders over-reward and under-coach employees over the course of their careers". Righteous top performers – "great employees whose performance is compromised by their righteousness and judgment of others." Effectively addressing these issues requires executives to stop managing and start leading. First of all, Wakeman writes, they have to "stop arguing with reality." This means relating to the facts of different situations at work, rather than the stories we tell ourselves or making judgments. An example might be when a coworker receives a promotion – you tell yourself that it's not fair, you should have received the promotion, you work harder than the coworker, you deserve it etc. This line of thought is judgmental and reflects "entitlement" thinking. Instead, if "you embraced reality, you would note that a promotion occurred and do the appropriate thing in such a situation: congratulate your coworker, offer to help and resolve to learn how to deliver what the company values. You'd be high on professionalism, low on drama and investing in better relationships and mutual support in the future…You are arguing with reality whenever you judge your situation in terms of right or wrong instead of fearlessly confronting what is." By the same token, instead of trying to keep employees happy, leaders should focus on helping them understand reality, while empowering them to build their capabilities to deal with all situations that arise. If you want to evaluate the behavior of the people you lead, you can take Wakeman's Freak-Out Factor test, which will show you how your organization or team measures up in terms of level of drama in the workplace. "Empowerment without Accountability is Chaos"
What is the one thing you need to be more productive in your work? What are the three things you are willing to do to get it? Such an approach eliminates the "victim factor" and builds accountability, while enabling leaders to understand what they need to do to truly empower their teams. In leadership, playing favorites is "fair game," Wakeman observes. "Too many leaders I work with have surrendered to the idea of mediocrity in order to never, ever offend anyone. Some leaders are so concerned with treating everyone the same that they are hesitant to give honest feedback". Leaders should spend most of their time coaching the employees who are delivering the best results. In reality, leaders spend "on average 80 extra hours per year thinking about and working with a single person who's in a state of chronic resistance". These people won't change and worse, the best employees will be dragged down by a negative office culture. The idea is to "compensate value, not effort" and give your focus to the employees who deliver. " You will have problem employees for as long as you continue to hire them and put up with them". Wakeman says your workplace is not a democracy. Ninety percent of the people in any organization at any given time are not key decision makers. Leaders need to set clear expectations and goals and focus the energy of their teams on working towards the desired results, rather than wasting hours complaining about why certain decisions are made. Offering constructive feedback is positive. Fighting against decisions that are not yours or your team's to make is futile. 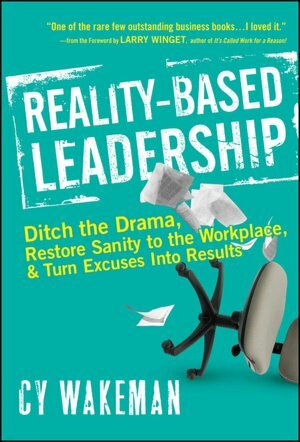 Reality–Based Leadership contains practical, mindset-changing and entertaining advice, anecdotes, tools, and recommendations that anyone who leads people in organizations should read. Just as sustainability relies upon a realistic assessment of business impacts on people, society and the environment and the formulation of appropriate strategies to improve these impacts, so leaders must confront the realities of how they behave in organizations, how accountable they are and how they leverage reality-based tools to ensure their sustainable contribution.